Are you a fan of no-bake cookies? I am! I love easy. The hardest part is waiting for them to harden up so I can enjoy them. These cookies are for all of you that are crazy about butterscotch. I have a chocolate version of these no-bake cookies that are equally delicious. It’s just a matter of melting a few ingredients and adding in the rest. Let them cool to harden on some wax paper and you’ll have a batch of delicious cookies in no time flat. They are chewy and sweet! I can only handle one or two at a time because they are so sweet – at least to my tastebuds. I love eating mine with a cup of coffee. Not a fan of butterscotch? Try using chocolate chips instead! For more yummy butterscotch recipes, try my Butterscotch Sauce or Butterscotch Blondies. You might also like this Cream Cheese Cookie Recipe. Do you love no-bake treats? Perfectly sweet and chewy, these no-bake cookies never last long in my home. Add sugar, butter and evaporated milk to a saucepan. Bring to a boil. Boil for 1 minute, stirring constantly. Remove from heat and stir in butterscotch chips. Stir in oats and coconut. Let cool 5 to 10 minutes. Drop by teaspoonful onto a piece of wax paper. Let cool for several hours before eating. I wish I had a plate of those at work today! YUM! I totally need to try these soon! I’ve always wanted to try No-Bake Cookies. I’ve tried the store bought kind and I didn’t like them – but I’m sure the homemade kind are much better. Thanks for sharing the recipe! These look so delicious!!! Must try them. These look very similar to the macaroons my mum used to make. They look very tempting. Yum, just pinned this recipe so I can try making them. 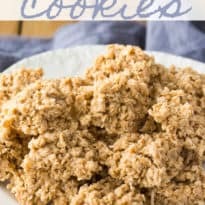 Love No Bake Cookies, so easy to make! I’m with you! I love easy. And I love no-bake. Thanks for sharing yet another delicious recipe. Printed this one. I’m always looking for quick easy recipes this would be an awesome after school snack for sure! These sound so good, love butterscotch and no bake! Miam! Miam! I totally need to try these soon! oh my these sound so good! I’ve been on a diet for months and I want these so much. And they’re gluten free! you had me at no bake.!!! Mmmmm, butterscotch is one of my favorite flavours. These look so easy and delicious! Those sound so simple to make! These look like a great treat to make for my coworkers. Oh Yummy!!! It is still over 90 degrees here so no-bake sounds good to me. Yum!! Those would be great to make for football games. These sound amazing and so simple! Pinning to try this fall. I love no bake cookies and desserts. They are so easy to make and foolproof in not making mistakes. These cookies look delicious! 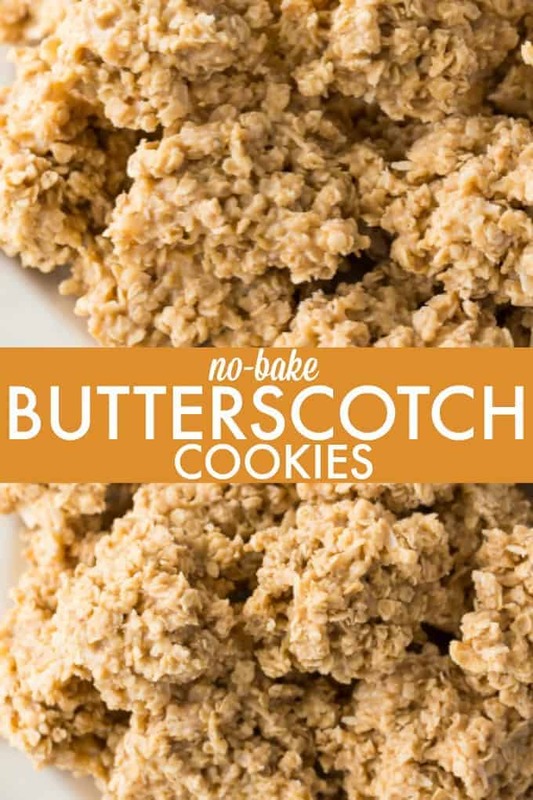 Your No Bake Butterscotch Cookies sound yummy! I really appreciate you sharing with us at Full Plate Thursday and hope you are having a safe and enjoyable weekend. Looks so good. Thanks for sharing this at the Inspiration Spotlight party. Butterscotch is such a yummy and sophisticated flavor. I like the idea of no bake cookies without chocolate but butterscotch instead. They look wonderful. Sounds like this is delicious and easy! These look sooooo yum!!! 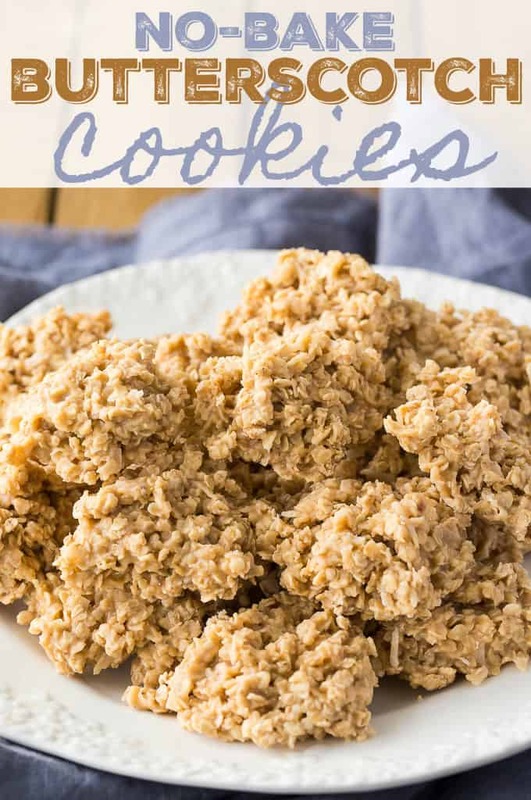 Always like no bake cookies and this has butterscotch, oats and coconut, OH MY!!! And love the comment to try with chocolate chips….thank you!!! These are ‘the bomb’!!!!!! Ohhhh so good!!!! And so simple!!! !